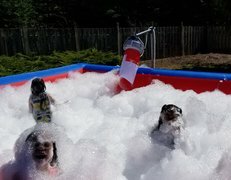 Have a blast when you, your family and friends play in the mountains of bubbles created by our foam Machine. Perfect for all events. Foam parties are a unique idea that will have everyone at your next event talking! Our specialized foam machines and foam mixture will pump out tons of bubbles in minutes. Pair the foam with a giant inflatable slip & slide or water slide for the ultimate foam experience. This should be a bucket list item!! Who would't have loads of fun playing in a mountain of FOAM! Great for all kinds of parties. Comes with 1 foam machine and up to 2 hours of foam. Great for every type of event or party and your guest enjoy a refreshing, safe and unusual party activity. Use it at your next kids birthday party and see how much fun the kids have playing in the foam. Foam parties are perfect for all age groups and any tupe of event.